Two Los Angeles Police Department officers were bitten several times by a 30-year-old man who had triggered a cash register alarm at an AT&T store in Tarzana Monday night, police said. 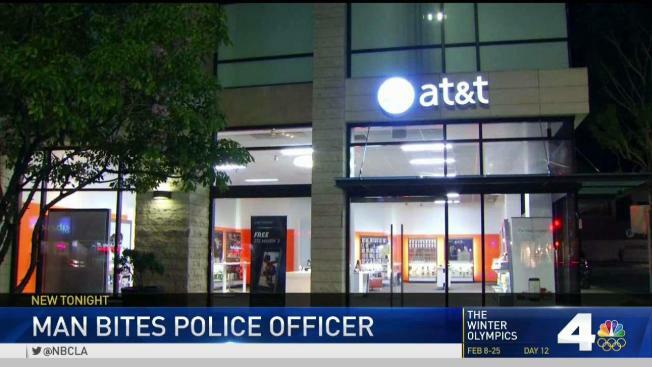 Officers from the West Valley Division responded to an alarm at the AT&T store at 18640 Ventura Blvd., between Reseda Boulevard and Wilbur Avenue, around 7:15 p.m., said LAPD Officer Tony Im. It's unclear what the man was doing in the store or if he was trying to rob it, Im said. While interviewing the man the officers got into a physical altercation with the suspect, Im said. Both officers suffered multiple bites from the man during the struggle. The officers then used a Taser to subdue him. Both officers went to Providence Tarzana Medical Center for treatment of their bite wounds, according to Im. The suspect was also hospitalized for treatment of injuries he suffered in the struggle. The charges the suspect would be booked on were not immediately known, Im said. "However, at the very least I would expect he would face assault with a deadly weapon -- his mouth -- on the officers," Im said.